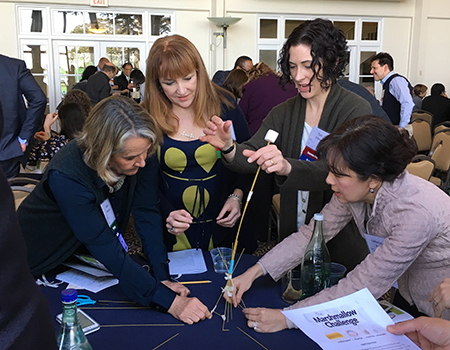 Taking on 2017 challenges and marshmallow towers: a report from the School of Medicine Leadership retreat. If you missed the inaugural Dean's Forum, watch the video and take a look at the Dean's Overview and schedule of future Forums. The next Forum will focus on our clinical mission (Feb. 27 at Mission Bay). Department chairs: Submit applications for Dean's Diversity Fund grants to help recruit and retain faculty who are deeply committed to diversity and service to the underserved or vulnerable populations. Deadline is Mar. 20. In partnership with UCSF Health and UCSF research community leadership, CTSI’s Informatics and Research Innovation (IRI) team is issuing a second annual call to the UCSF community for Learning Healthcare System project proposals. Open submission phase closes Feb. 26. Advanced Training in Clinical Research (ATCR) Certificate Program provides detailed instruction in the methods of clinical and epidemiologic research and ongoing methodologic guidance as scholars begin to implement their research. Deadline to apply is May 8. Construction work in the Clinical Sciences Building will remain quiet throughout March while bidding for Phase II is underway. Learn more and share with colleagues by visiting this link and sharing this flyer. Shawn Douglas, PhD, was named by President Obama as a recipient of the Presidential Early Career Award for Scientists and Engineers (PECASE). Lily Jan, PhD, and Yuh-Nung Jan, PhD, have received the Vilcek Prize in Biomedical Science. Student Jirayut "New" Latthivongskorn was named to the "30 Under 30" list by Forbes magazine. To support the personal and professional lives of staff employees, Staff Resource Day offers resources, workshops and opportunity to meet staff from across UCSF on Feb. 10.